Marshy ground, calcareous fens, and shrub-carr. Also in moist swales and in bogs. Newfoundland west to AK, south to PA, IN, IL and northern Mexico. Colonial shrub to 3 m, often forming dense thickets; twigs reddish, often with the red intensifying in the winter; older bark smooth, thin, reddish-gray. Leaves opposite, ovate, acuminate, simple, entire, deep green above, lighter beneath; most with more than 5 pairs of lateral veins. Flowers small, in flattened upright cymes. Fruit white, berry-like, on red peduncles. 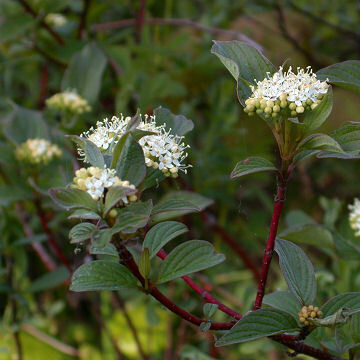 This species is similar to gray dogwood, C. racemosa. It is more likely to be found in wetlands than C. racemosa but their habitats do overlap. Usually only the youngest twigs are red in C. racemosa and they soon turn gray. The pairs of lateral veins is possibly the best characteristic to use during the summer. In the winter the bright red twigs of Red-osier really stand out. This species is also known by C. stolonifera Michx. 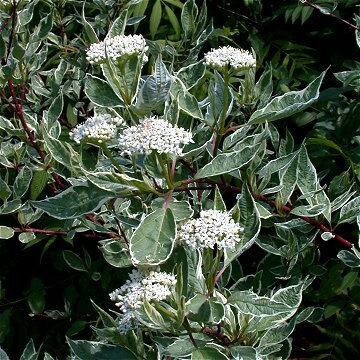 and some authorities consider it conspecific with the European C. alba L.